All fruit dealers hope their fruits become famous. Joseph Sherfy likely never imagined his peach trees would become the most renowned peach orchard in Civil War history. But, like many Gettysburg civilians in 1863, the war appeared on their doorsteps, businesses, and farms—changing their lives, and landscapes, forever. On the morning of July 1, 1863, the Sherfy family heard the first sounds of battle northwest of Gettysburg. 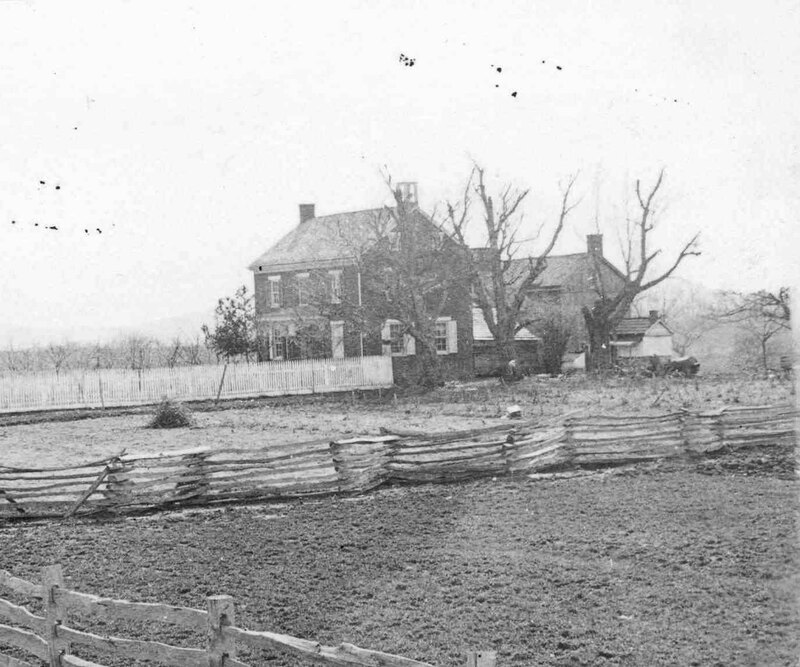 That night, Union troops moved into positions around the Sherfy farmhouse. By July 2, the family remained inside their home until a Union officer urged them to retreat. Joseph’s mother-in-law, Catherine, experienced a dangerous encounter that morning. “A mini-ball fired from the Confederate side on the west had struck the board fence,” the family later recalled. The family, who consisted of Joseph and his wife Mary, their six children, and Mary’s mother, Catherine, decided to flee to the John Trostle farm southeast of Big Round Top and from there fled to Littlestown for the remainder of the battle. It was a wise decision to flee the farm as heavy fighting raged around the Sherfy property and house until about 6:30 p.m. when Confederates broke through the Union position. The house was riddled with bullets, and the peach orchard became a battlefield. Wounded soldiers crawled into the house and barn for protection until the barn burned to the ground at the height of fighting. Joseph Sherfy returned home on July 6 to a house and farm in shambles. He saw bloodstains on the floors and bullet holes inside and outside the house. The roof had several holes from artillery rounds, the dead had been buried in trenches around the yard, and dead horses plagued the property. The peach orchard was practically ruined and most of the young trees had been pulled out or knocked down. The barn and hog stable were burned, the windmill damaged, and several of the Sherfys’ animals were killed. Despite the lack of assistance he received from the government, the Sherfy family replanted and rebuilt and for years sold peaches from their orchard, branding them as peaches from the original trees on the battleground. The farm became a popular attraction for Battle of Gettysburg veterans. According to a member of the 687th PVI, Mrs. Sherfy had a wall in her house covered with photos of soldiers she met that fought on her property. The Sherfys continued to live in the house until Joseph’s death of “typhoid malaria” at the age of 70. The National Park Service acquired the farm in 1969. Today, the Sherfy property is still actively producing produce. The Gettysburg Foundation, with Gettysburg National Military Park and the Civil War Institute at Gettysburg College, harvest vegetables, fruit, and herbs in the Sherfy garden. Without digging into the battlefield landscape, volunteers gain the experience of using special techniques to grow crops from heirloom seeds. All harvested produce—2,000 pounds in 2015 alone—is donated to local food banks and community-based programs like Meals-on-Wheels and the Campus Kitchen.